Thirty something years ago a young man named Richard Branson formed a company called Virgin. He started with a record label which produced some of the most famous bands of the seventies and of course today we have Virgin Airways (yes, they do go all the way) Virgin Money, Virgin Mobile etc. This has made Richard a lot of money and one thing he did buy was his own private Caribbean island called Neckar. This is where the likes of Pee Daddy, Beeonsay, Jay Low and other celebrities pay trillions of dollars to experience the finest in Caribbean luxury without having to share them with ordinary mortals like me and you. In fact, legend has it that George Hamilton’s tan comes mostly from the beaches of Neckar. Visiting and vacationing on a private island it would seem is just for the rich and bronzed………………………..or is it. 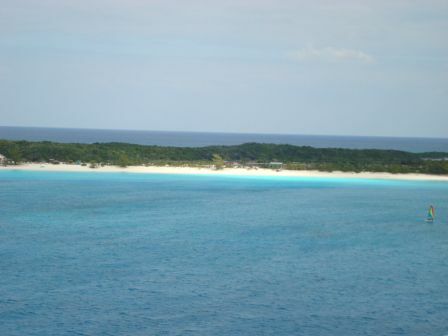 A few years ago our sister company Holland America bought an island they would call Half Moon Cay and it has become one of the most talked about destinations our corporation ships visit …………….. and today, for the first time…………….I got to see it for myself. Now, you may remember that just before or just after Christmas I slapped on an interview with my friend Matt Sams who is a Vice President of …….something………..and is largely responsible for the islands success. 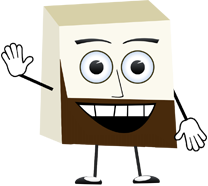 So, before you read my review maybe you should click this link thingy to read all about it……………….go on………………..I will wait here for you. As you will have read the ships anchor just off the coast of this incomparable island. Tendering here on the Carnival Imagination is handled quickly and professionally with the busiest time seeming to be between 10 am and 11 am. However, there was never more than a 15-minute wait for the tenders and the wait is certainly worth it because the reward of your own private island is waiting for you. Before we talk about what the guests do we should mention that this is a very busy day for the ship’s company. 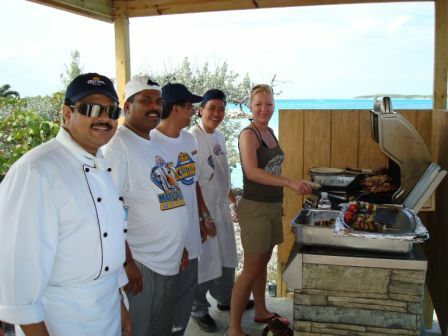 The crew of every ship are responsible for providing the food, the drinks, the entertainment, the music, the clean-up operation in fact the entire aspect of the service that is provided on the island is done so by the ship’s crew. I say this because as Heidi and I were strolling around we heard a lady say to her partner………”he looks just like our waiter” …………….. and, of course, it was. The staff and crew of the Carnival Imagination did a brilliant job and provided the same friendly and fun service ashore that they do onboard……………..congratulations to them. There is also some staff on the island that also assists in making this a brilliant port of call. This is also the only port in the world where you can use your Sail and Sign ship cards. 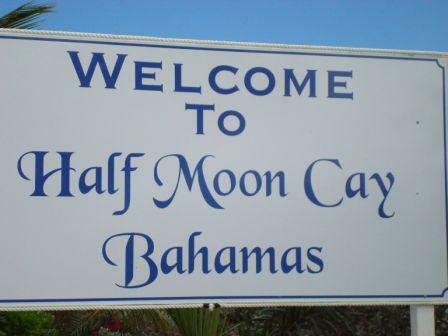 Although I have read many comments over the years where guests have gone ashore and come back upset and angry because the local T-shirt shop refused to take their card …………… well……………on Half Moon Cay you can use it to buy drinks and other items. You should however take with you some cash as there are one or two souvenir shops that are separate concessions that will not take the magic card. Arriving on the island the first order of the day from the Mrs. was to take of my shoes and socks…………….OK………….I know what you are thinking…………he wore socks……………to the beach………………..well, I am sorry but this is a very British thing and I know it gets on her nerves. So, once ashore that was me………………..hopping around on one leg trying to take my socks and shoes off. Once I had met the required dress code we started our walk along the beach knowing that as soon as we did Heidi would start talking about love and the future…………..its as though sand brings out the romantic in her……………..me…………….I hate the way it gets between your toes and if there is a sharp object that is buried beneath the sand it will be me that stands on it. 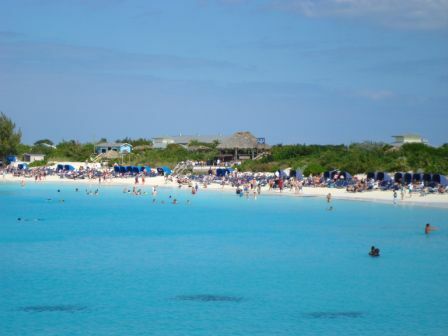 I mentioned yesterday that the beaches in Grand Turk were amazing ……………..well if they were the Lexus of beaches…………then the half Moon Cay sands are the Bentley GTC ……………..they are………………. simply gorgeous. 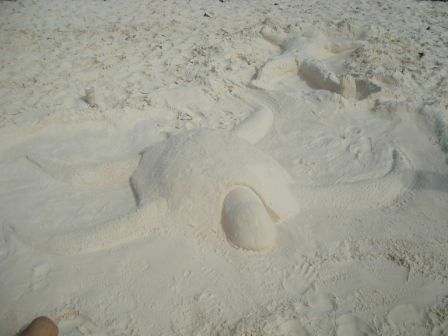 As we wandered the beaches we saw the different ways people were enjoying their time. 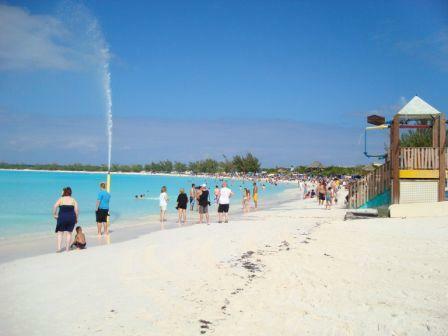 Many were just sunbathing, running over the hot sands as quick as they could to jump into the tanzanite-coloured water. Of course there is always one person who has to spoil the picture and we saw that person today………………I apologize if he is reading this blog thingy but bloody hell……………….what were you thinking? It was a man…………..of course it was……………and many of you will already be ahead of me on this one. Yep, he was wearing the dreaded Speedos. Now, I have threatened to wear these on many occasions but of course this is just a threat and I would never ever subject anyone to the sight of me in a skimpy pair of these plum- smuggling swimming attire. He was a big man, he made me look like a stick insect, however, he wore a pair of Speedos which proclaimed that he was a proud, proud American. This is because the Speedos were patterned after the Stars and Stripes flag. However, the only way to discover this pattern was if you were actually laying on a sun bed looking up, as Heidi and I were, when he passed by. He seemed oblivious to the laughter that followed him down the beach and if the view of the great American flag was disturbing from the front, the view from the back was horrific. I will leave the rest to your imagination. His wife or partner was also very patriotic and her one piece bathing costume was also of the same material, although gravity meant the flag was flying at half-mast. I wanted to take a photo but this suggestion was met by one of those Heidi looks so that particular avenue of pleasure was closed. 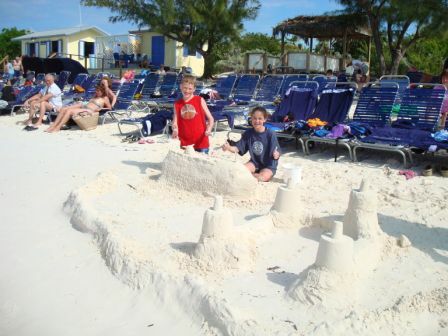 The island has a wide variety of choices with what to do. 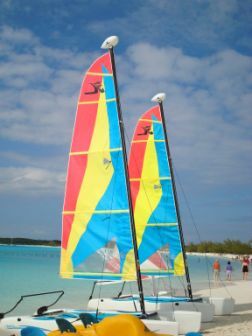 For a wee bit extra you can rent safe, non-motorized water sports equipment, kayaks and cabanas. 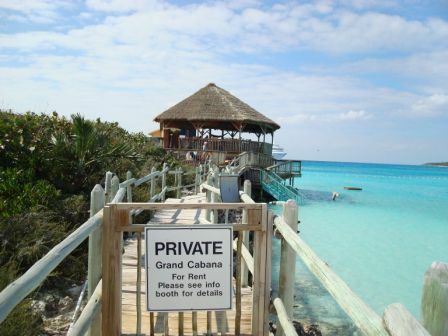 The cabanas are especially popular and provide that extra touch of luxury. There is also something extra special, a place where you would expect to find George Hamilton turning further brown a supermodel rubbing cream on his back. It’s called The Oasis. 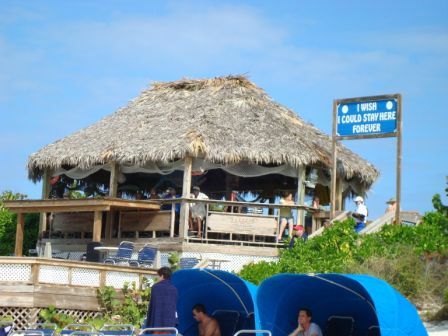 It sits at the point of the bay and includes a covered cabana, a private chef and open bar to cook and serve for you all day. A huge Jacuzzi tub, love seats and direct access to the beach and the water……………………it accommodates up to one dozen people and if you are sailing with a large group or family or you just want to taste a piece of utter indulgence then the Oasis is for you. Further up the beach we saw one of the brilliant shore excursions taking place…………………….horseback riding along the beach. This for many is the fulfillment of a dream. Riding along a Caribbean beach on a graceful horse is right up there with swimming with dolphins and having Jessica Simpson wash your Aston Martin car with warm soapy water wearing just a bikini. The horses seemed to be enjoying the canter along the beach and through the water. There were big horses, small horses and one huge stallion that had a male guest on his back. The horse was thundering along the beach and this slightly built chap was bouncing up and down with a look of distress on his face…………….I think the horses name was Nutcracker. Anyway, this is one brilliant tour and no wonder it is always sold out. 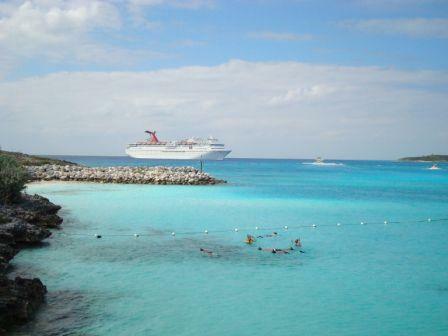 There is also snorkeling, swimming with the stingrays and other water sports available as well. 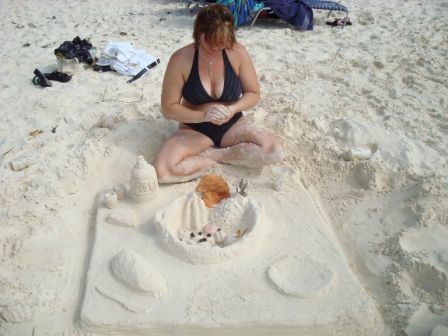 The ship provides an extensive range of activities as well including a treasure hunt, a yoga class on the beach, our own version of Survivor and the Sandcastle Building contest…………………..the winning entries are included in the photographs below. 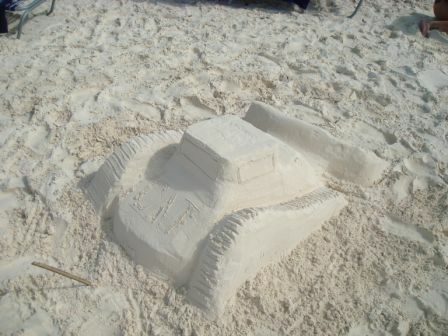 My personal favorites were the fruit bowl, the CAT bulldozer and the turtle…………….fantastic. However, for most people the day just meant, sun, swimming and a romantic stroll down the deserted side of the island with the one you love. Food is of course important and an army of Carnival Imagination crew provide a continuous barbecue served in a huge pavilion …………..many took the food “to go” and sat on the sand and enjoyed a hotdog or 7. 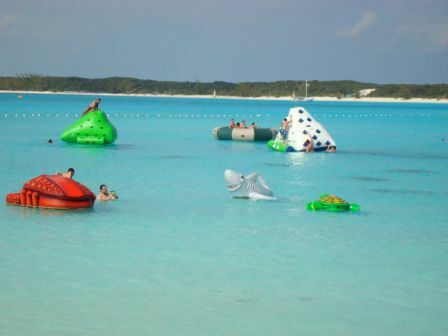 One of the best compliments I can give this place is that when I just left at 3:30 pm there were still 1,788 guests ashore……………..this shows just what a great time they were having. 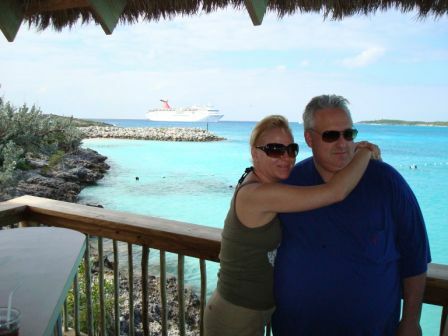 Congratulations therefore to Carnival Corporation, Matt Sams and all the people who have made it possible for ordinary people to sample the joys of private paradise on their own fantasy island. 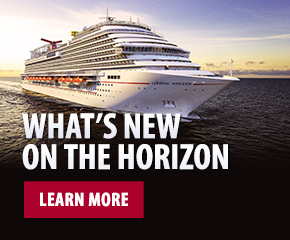 The cruise is going too quickly. 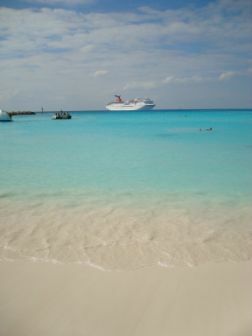 Tomorrow we will be in Nassau and I will remain onboard so I can write about the Spa and the new adults- only area called Serenity.